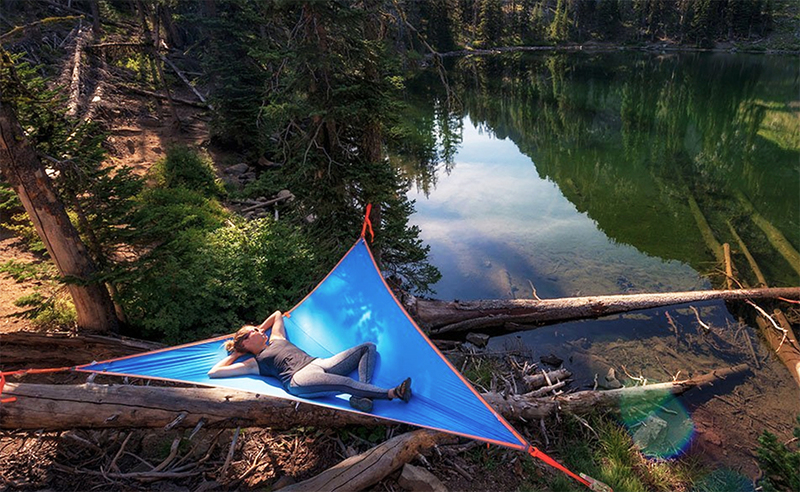 Alex Shirley-Smith, founder, Tentsile Tree Tents, pictured below, is fulfilling his childhood mission of saving trees. Since he was a small boy, Alex had a passion to save the rainforest. That passion grew into a successful career in treehouse design. 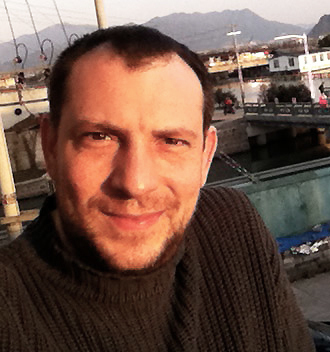 An accomplished architect, Alex has taken his designer skills to crafting the world’s most comfortable tree-based tents that are more environmentally friendly than permanent structures because there is no damage to the structure of the tree. This year Tentsile is celebrating their five-year anniversary. We took the opportunity to talk with Alex at his home in London to find out how he has fulfilled his childhood dream one tent at a time. 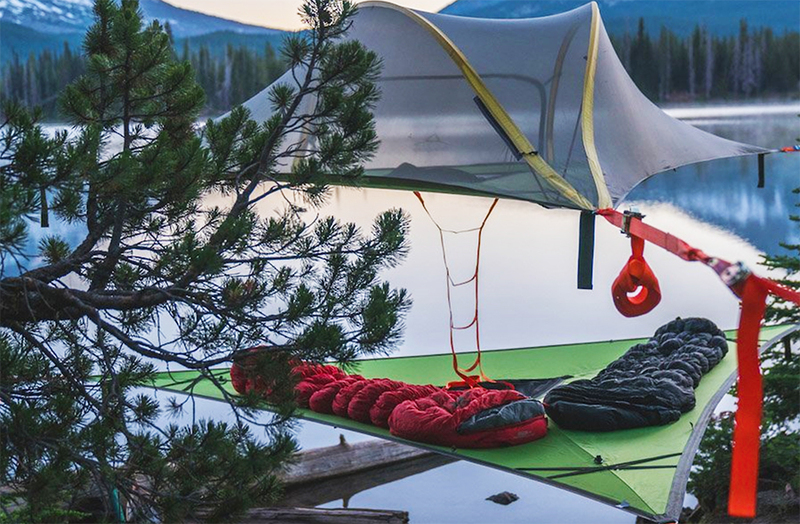 What are the drivers for Tentsile since your first tree tent went to market? We opened a whole new way of camping in the trees and forests. We are constantly refining. It is still surprising the amount of useful feedback we get from our customers. There are things that we are doing wrong and things that we are doing right. One of the things that we have been doing wrong is basically ad hoc adapting and improving the products without bringing out the model upgrade. We’ve been doing it in batches. We are working toward a more structured improvement process, which means across the board, every couple of years, customers can upgrade with confidence that the latest model will have the latest features, whether it be built-in solar panels or LED lighting, so the new models are effectively much more different and vastly improved from their older models, allowing people to upgrade easily, knowing that those upgrades are big jumps and big improvements on their last purchase. Do you have brand ambassadors that are testing the product? We do. It’s a third-third split. Athletes, camping adventurers who test for weeks or months at a time and then the average consumer and testers of outdoor gear. We take pride in listening to our customers, and also we have a close relationship with them so that they can feel that they can bring feedback back to us without feeling badly. We reward people for sending in their critical feedback. In the third grouping, you also have the product testers, and know what they are looking for in outdoor gear. They have done it all before, and know what the language is that people need to hear and use in order to understand what they are talking about when they are talking about different pieces of technical equipment. Do Tentsile tents do any damage to trees? I refute that notion. We design tree tents to have a positive impact on trees, not to damage trees or the bark, unlike slacklining ,which is an extremely dynamic activity. We also sell tree protector straps, which are three times wider than our inch-and-half straps, which spread the load much more evenly over a wider tree surface, such as Redwoods, which are soft bark trees. As a trained architect, my knowledge of construction is solid on this. What are the trends in products Tentsile will show at OR Summer Market? We’ve gone heavy-duty on half of the tents we will show for the season and lightweight for the rest. We just brought out our first single-person, three-point tension tent. It is not a hammock. It is a flat lay. You can lay on your front and your side and it comes in just under six pounds. 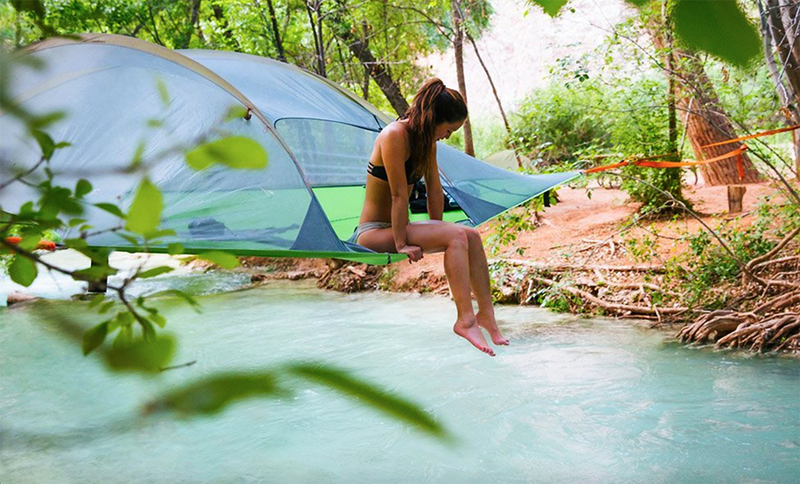 It’s called the Tentsile Una. It is our lightest backpacking, single-person tent. On the other end of that spectrum we brought out two new versions of existing models. The Stingray and the Connect—both in what we call the Safari Range—the Safari Stingray and Safari connect–which are made out of double-durability fabrics and inset mesh to cater for the increase in what we see in the trend of Airbnbs and more permanent rental setups. We had a lot of people last year starting to buy five or more tents to rent out through the summer. After three or four weeks, the tents were getting scruffy and people were not looking after the equipment in the same way as if it was your own tent. And so the people who were renting these tents out in mass were cycling out the old tents to put in new ones. We decided we would help them by bringing out a heavy-duty version which could last all summer with a vastly improved manufacturer’s warranty. At the heavy end we have the Safari range. At the light end we have the Tentsile Una, and right there in the middle we brought out what compliments the medium range, which is the existing Stingray and the existing Vista tent—a two-season, three-doored version of our tree tent models. We brought out the Stealth, which is a modular system, which works on the basis of our floor plan with a one-pole roof system with a completely removable mesh net, which the Stingray does not have. And you have a weatherproof four-season-proof rainfly that goes over the top. It’s really simple to set up and an improvement on the Vista tent. It sits somewhere between the two-season Vista and four-season Stingray tent, but the Stingray only has one door and one hatch, where the Stealth has a door on every side of the trillium. Each occupant has their own access point. The Stealth answers a lot of questions we have been asked by our customers, and the complete range answers all of the questions and, hopefully, now we have models that suit everyone. What is the one tent we should know about for this season? Our newest tent, which was the most exciting to design, that we just just brought out and displayed at the German outdoor show and we will display at OR Summer Market, the Tentsile Universe, shown below. 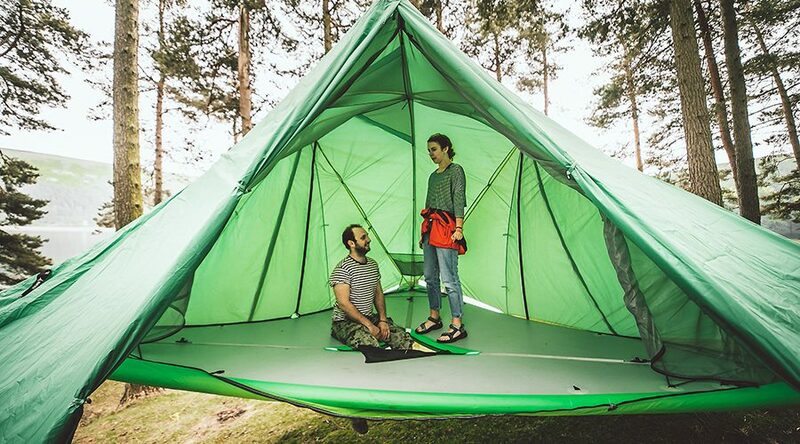 It is the world’s first three element tent. 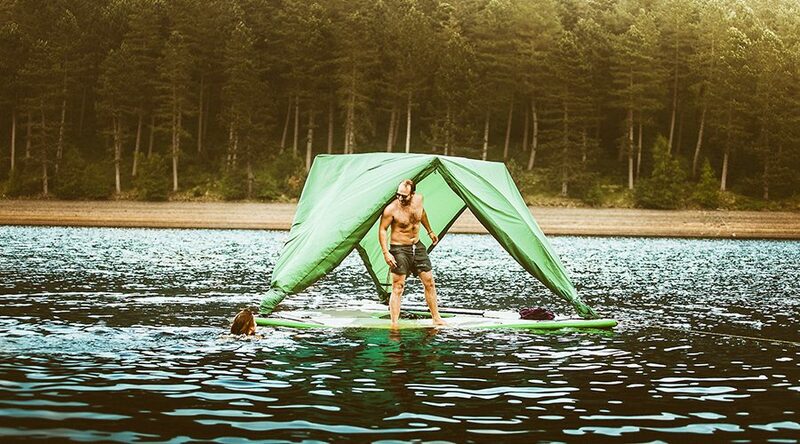 It’s Tentsile with a blow up, stand up paddleboard style floor, that we made in conjunction with Blyth Paddleboards. It works on the floor, in the air as a tree tent, and it can also be used as a pontoon day rafter. What was the lightbulb moment for you to design the Tentsile Universe? One of the comments we have gotten from customers is getting a cold back during the night in a hammock tent. Of course, we have a number of solutions for that. I always wanted to have a blowup floor that was integrated into the tents. And when we started looking at blowup floors for insulation purposes, we realized that if we did this properly, our tents could also sit on the ground, which means that you don’t have any lumps and bumps on the ground. If we did it very hard, like a standup paddle board, and made that floor blow up to one point one half bars; that means you can have your tree tent in the air as usual, but this time with a stand up floor, because the whole thing is rigid. And then, we realized that if you are going to have a blow up stand up floor that was rigid, if we made the roof adaptable enough, we would be able to create a water-going vessel with a sunshade roof for friends and family to go fishing, have a beer out in the water tethered to the side. Pull it in at night, set your tent into night mode and you’ve got a three-element tent. When you lift the tent off the floor you get nearly 200 square feet of area under the tent–basically a living room. So now, all of a sudden, when you pitch the fly sheet out, you have room for five people to sleep upstairs and room enough for 10 people to have dinner downstairs. What is the weight of the tent? The Universe is 100 pounds. It comes in a luggage bag with big grippy wheels. 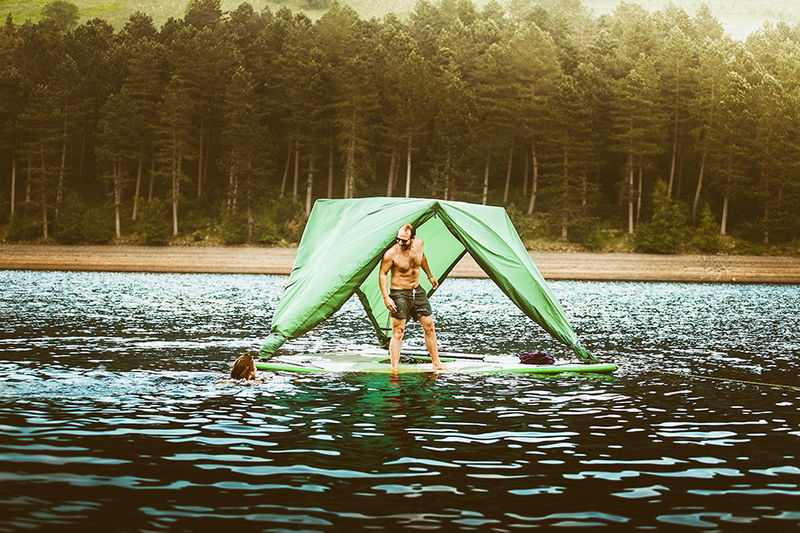 This was the second-most rewarding tent to design after our first tree tent in the Tentsile collection, because when you see people jumping around in the water on it, having such a good time, and it works so well, it was worth the hard work to develop. For just five years in the industry, you have made great strides forward; would you agree? Yes, we’ve pushed ourselves quite hard. And I really like to design. Every year we come out with at least one new model. Do you have competitors in the tent space? There are some companies that are marketing their tents as ‘tree tents,’ but we’re not concerned because a lot of them are more expensive and do not function as well. Our intellectual property has held up without anyone yet effectively entering our space. What defines a tree tent? Let’s define a hammock first. You need two trees, two points to hook up and one person occupancy. More than one person, you’re all rolling together and it’s not comfortable. A tree tent has more than two attachment points, which allows it to have no swing, is more structurally sound and because of that structure, it also allows multiple occupancy without the downside of all rolling into each other once you get in. Regeneration of treetops is at the core of the company. Any new initiatives? We have just passed the 325,000-trees-planted mark in the three years we began planting trees. We are planning a kickstarter project where we are going to invite the public to make donations in order for us to all together to buy and protect the biggest piece of rainforest in Indonesia that we can, to save the Orangutan. We are also planning the first permanent Tentsile owned, Tentsile run, experience camp in Central Europe where you can come anytime of the year to play around in tree tents and sleep in the trees. Where is your R&D located? In London, we test our tents in two different parks. In America, we have two brick-and-mortar stores, one in Ogden, UT, and one in Bend, OR. And both of those places have tents permanently set up for people to come in and try them out. What is your personal perfect tent experience? I’m not one of those people who can sit down and have a relaxing time watching the sunset. I just want to be up playing with rope and making everybody comfortable, making rope swings so that everybody else can have the best time. That’s my perfect tent experience. To run around making the camp perfect for everybody else. I’ve found my perfect niche: designing and making tents. It doesn’t feel like anything anyone has experienced before. It’s not a hammock; it’s not a trampoline; it’s more comfortable than either of those and it’s more comfortable than you can image. We are trying to get out to the festivals and expos as much as we can to bring that experience to as many people as possible.